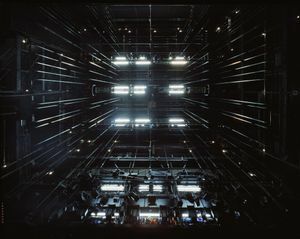 Since 2010 Klaus Frahm works on a new photographic project : theater and opera-houses. 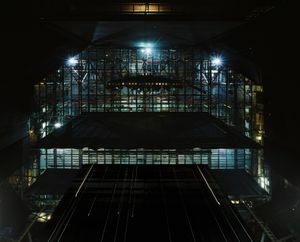 Known for his works on architecture and design published in numerous books and exhibitions this theme seems not so far away from that genre. 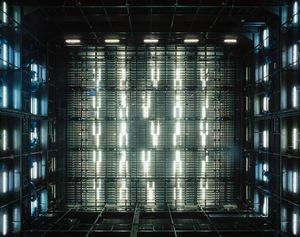 Other photographers come into the mind - Hiroshi Sugimoto and his cinemas or Candida Höfer with Paris-Opera, but Frahm's photographs make different point. 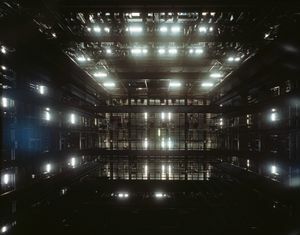 While Sugimoto explores the empty center and Höfer cools down the opulent decor in bright light, Frahm explores the scene inside the scene, reversing the classic connotations of theater. The history of modern theaters begins in 1585 with Andrea Palladio‘s Teatro Olimpico in Vicenza. It was the first theater to be covered by a roof. In Europe and especially in Germany we look at a long tradition of theater-buildings. More than 90 Opera-houses still exist today only in Germany. 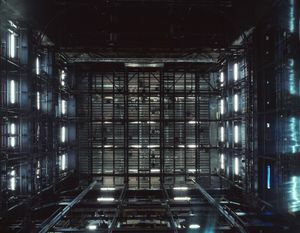 The photographic project deals with theater and opera stages. "The Fourth Wall" is a term known by actors and means the opening of the stage towards the audience. Classically the theater is perceived in the direction of the audience towards the stage, a window in a box to look at, where the scene happens. 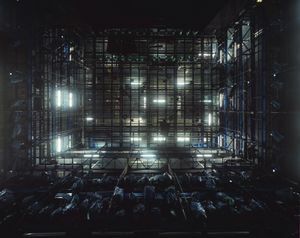 In this series the direction of the viewpoint is opposite, taking the perspective of the actor, the camera is far behind the iron curtain. 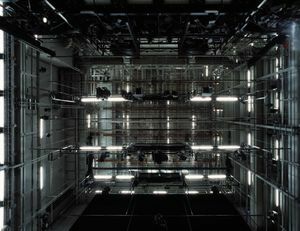 In the images the space for the audience is becoming flat like postcard and the real space of the theaters, the stage, is explored in many directions, looking up or to the sides and going into details. Thus we get aware of a work-space hidden behind the red curtain. It is the specific perspective of the camera, which dissolves the order of what is in front or behind, questioning the hierachy of stage and audience as well as the image. For the French philosopher Lacan an image is a look put out, the lightpoints sending out rays to the viewer - the image looks at the onlooker. 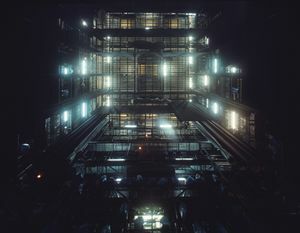 The contrast of machinery and the "sofa-room" is exciting, if you imagine for example the "Berliner Ensemble" where all the plays of Berthold Brecht were acted out for an audience sitting in bourgeois neo-baroque surrounding. 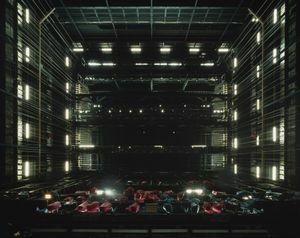 -Where is the stage? 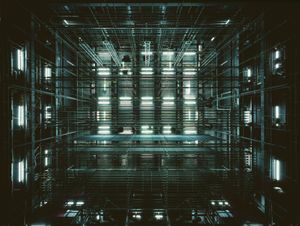 The series "Cages" is an extension of the "Fourth Wall" and could be called the Fifth Wall, because the visitors will never see the mechanism which allows a quick change of backdrops and other stuff like lights. 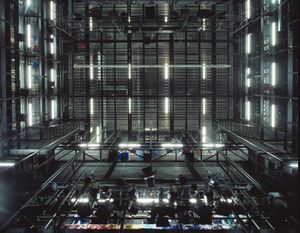 All these things are stored for each piece differently in a high tower above the stage. 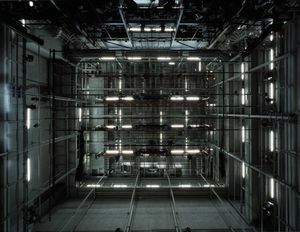 Looking with the camera directly and straight up to the ceiling, the resulting image appears like a normal space, but with abstract functions.